Not to be confused with Great Offices of State. For other uses, see Great Officer of State (disambiguation). 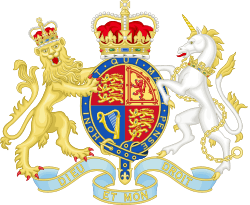 In the United Kingdom, the Great Officers of State are traditional Crown ministers, who either inherit their positions or are appointed to exercise certain largely ceremonial functions or operate as part of the government. Separate Great Officers exist for England and Scotland, and formerly for Ireland. Many of the Great Officers became largely ceremonial because historically they were so influential that their powers had to be resumed by the Crown or dissipated. Government in all the medieval monarchies generally comprised the king's companions, later becoming the Royal Household from which the officers of state arose. Initially having household and governmental duties, later some of these officers split into two counterparts in the Great Officer of the State and the Royal Household, or were superseded by new officers or absorbed by existing officers. This was due to many of the officers having become hereditary and thus too removed from practical operation of either the state or the household. Initially after the Norman Conquest, England adopted the officer from the Normandy Ducal court (which was modelled after the French court) with a steward, chamberlain and constable. Initially having household and governmental duties, some of these officers later split into two counterparts in Great Officer of the State and the royal household. While other officers were superseded by new officers or absorbed by existing officers. This was due to many of the officers becoming hereditary due to feudalistic practices, thus were too removed from the practical operation of either the state or the Royal Household. The Lord High Steward and Lord Great Chamberlain were superseded in their political functions by the Justiciar and Lord High Treasurer, and in their domestic functions by household offices with similar titles. The marshal of England assumed the place of the constable of England in the royal palace in the command of the royal armies. The Chief Justiciar was once ranked above the Lord High Chancellor in power, influence and dignity until 1231 when the position lost its standing in the Kingdom. While most of them early on became hereditary, currently some offices are appointed, while others inherit their positions. The Lord High Stewardship was held by the Earls of Leicester until 1399 when the holder became the Sovereign; and since 1421, a Lord High Steward has generally only been appointed temporarily either for the day of a coronation or for the trials of peers (before 1948). The office of Lord Great Chamberlain is also hereditary, originally being held by the Earls of Oxford. Later, however, the Chamberlainship came to be inherited by multiple heirs, each holding a fraction of the office. One of the holders, chosen by rotation, exercises the office as a Deputy. The post of Lord High Constable was originally inherited by the Earls of Hereford, until when one holder was attainted and executed in 1521, the office reverted to the Crown, only to be reinstated for the day of a coronation. The final inheritable office is that of Earl Marshal, held by the Dukes of Norfolk. During the many periods in which the Dukes were attainted, another individual was appointed to the post. Furthermore, prior to 1824, the Earl Marshal had to appoint a Protestant Deputy if he was a Roman Catholic. Some offices are put into "commission"; that is, multiple commissioners are appointed to collectively exercise the office. The office of Lord High Treasurer has been in commission since 1714: the First Lord of the Treasury is the Prime Minister, the Second Lord is the Chancellor of the Exchequer, and the remaining Lords Commissioners are Government Whips. The office of Lord High Admiral was for many years also in commission, but merged with the crown in 1964 and is now an honorary appointment in the gift of the reigning monarch. HRH Prince Philip, Duke of Edinburgh (consort of the current monarch) was granted the title on his 90th birthday. The remaining officers became governmental officers: Lord Chancellor, Lord President and Lord Privy Seal — are appointed by the Crown on the advice of the Prime Minister. The posts of Lord President and Lord Privy Seal are normally combined with a cabinet minister usually that of Leader of the House of Commons and Leader of the House of Lords, respectively, but from 2003 the posts have been reversed, and since 2009, the Lord President has been another Cabinet minister. The Great Officers had and have varying duties. The Lord High Steward was originally a holder of significant political power, but gradually became a ceremonial office, as have the Lord Great Chamberlain, Lord High Constable, and the Earl Marshal. The Lord High Treasurer, Lord High Constable, and Lord High Admiral were originally responsible for monetary, military, and naval matters respectively. The Lord President of the Council is responsible for presiding over the meetings of the Privy Council. The office of Lord Privy Seal is a sinecure, though he is technically the Keeper of the Privy Seal. The Lord Chancellor is the most important of the Great Officers: he is the cabinet minister responsible for the Ministry of Justice, formerly the Lord Chancellor's Department and the Department for Constitutional Affairs) and formally Keeper of the Great Seal. The House of Lords Act 1999 removed the automatic right of hereditary peers to sit in the House of Lords, but the Act provided that the Lord Great Chamberlain and Earl Marshal be exempt from such a rule, so that they may continue to carry out their ceremonial functions in the House of Lords. With the Constitutional Reform Act 2005, the Lord High Chancellor has been replaced in some roles by Lord Chief Justice of England and Wales as head of the judiciary and Lord Speaker as chair of the House of Lords. The term "officer of state" is sometimes used loosely of any great office under the Crown. As in England, many offices are hereditary. A number of historical offices ended at or soon after the Treaty of Union 1707. There are also a number of Officers of the Crown and Great Officers of the Royal Household. After the abolishment of the Mayor of the Palace, France established seven officers of the crown (ordered by rank): the high constable, The high admirial, The high or great chancellor, the great justiciar, the great chamberlain, the great protonotary, and the great steward or seneschal. These offices were duplicated in the Kingdom of the Two Sicilies and Scotland. By the time of King Malcolm II, the great protonotary was extinct and the great justiciar was replaced by the lord justice general. The post of High Constable is held by the Earls of Erroll. Originally, the heads of the Keith family held the office of Earl Marischal, but in 1716, the holder was attainted for treason, and the office has not been regranted. The Dukes of Argyll are the Hereditary Masters of the Household. All other officers are Crown appointees. Many of these offices, though originally associated with political power, are only ceremonial now. The remaining officers are related to Scotland's judiciary. The Lord Justice General was originally an important noble, though in the 19th century, the office was combined with that of Lord President of the Court of Session. Now, the Lord Justice General is the head of Scotland's judiciary. The Lord Clerk Register is an officer with miscellaneous functions that included conducting the elections of representative peers and registering births and deaths. The Lord Advocate is at the head of the law offices of Scotland; all prosecutors act in his name. The Lord Justice Clerk serves as a deputy of the Lord Justice General. Finally, the Lord Lyon King of Arms is the sole judge in the Lyon Court, which determines cases relating to heraldry. A number of offices ended at or soon after the Union of 1707. These include the High Chancellor, the High Treasurer, the Treasurer-depute of Scotland, the Secretary of State, Scotland, the Master of Requests and the President of the Privy Council. 1 2 3 4 5 6 7 Chisholm, Hugh, ed. (1911). "State, Great Officers of". Encyclopædia Britannica (11th ed.). Cambridge University Press. Access on 29 March 2012. 1 2 3 4 Chisholm, Hugh, ed. (1911). "Household, Royal". Encyclopædia Britannica (11th ed.). Cambridge University Press. Access on 29 March 2012. ↑ "Michael Gove moves to justice in post-election reshuffle". BBC. 10 May 2015. Retrieved 11 May 2015. ↑ Chisholm, Hugh, ed. (1911). "Justiciar". Encyclopædia Britannica (11th ed.). Cambridge University Press. Accessed on 29 March 2012. ↑ Chisholm, Hugh, ed. (1911). "Lord High Steward". Encyclopædia Britannica (11th ed.). Cambridge University Press. Accessed on 29 March 2012. ↑ Chisholm, Hugh, ed. (1911). "Lord Great Chamberlain". Encyclopædia Britannica (11th ed.). Cambridge University Press. Accessed on 29 March 2012. 1 2 Chisholm, Hugh, ed. (1911). "Lord High Constable". Encyclopædia Britannica (11th ed.). Cambridge University Press. Accessed on 29 March 2012. ↑ Chisholm, Hugh, ed. (1911). "Earl Marshal". Encyclopædia Britannica (11th ed.). Cambridge University Press. Accessed on 29 March 2012. 1 2 Chisholm, Hugh, ed. (1911). "Lord High Treasurer". Encyclopædia Britannica (11th ed.). Cambridge University Press. Accessed on 29 March 2012. ↑ Chisholm, Hugh, ed. (1911). "Treasury". Encyclopædia Britannica (11th ed.). Cambridge University Press. Accessed on 29 March 2012. 1 2 Great Officers of State: The Lord Great Chamberlain and The Earl Marshal. The Royal Family. debretts.com. Debrett's Limited. Accessed 17 September 2013. ↑ Chisholm, Hugh, ed. (1911). "Admiral". Encyclopædia Britannica (11th ed.). Cambridge University Press. Accessed on 23 September 2012. ↑ Chisholm, Hugh, ed. (1911). "Lord President of the Council". Encyclopædia Britannica (11th ed.). Cambridge University Press. Accessed on 23 September 2013. ↑ Rozenberg, Joshua (30 January 2013). "Lord chief justice: changes to judiciary 'eroding something important'". The Guardian. Retrieved 17 July 2014. ↑ "Lord Speaker". BBC.co.uk. 1 October 2008. Retrieved 17 July 2014. ↑ Walter Goodal (1872). A Short Account of the Officers of State, and other Great Officers in Scotland. Transactions of the Royal Historical Society, 1, pp 415–426. doi:10.1017/S008044010000075X. Chamberlayne, Edward and John Chamberlayne. Page 396. Magnae Britanniae notitia, or, The present state of Great-Britain: with divers remarks upon the ancient state thereof. Edition 25. Godwin, 1718. 1 2 3 4 Page 396. ↑ Magnae Britanniae notitia. Page 399. ↑ Magnae Britanniae notitia. Chapter V. Page 400-401.